The Missouri Pacific Railroad, State Highway 64 and Interstate 40 run in triplicate through the River Valley region of Arkansas with a gentle northern angle from east to west in parallel with the Arkansas River. For centuries after the first explorers ventured west of the Mississippi River, the Arkansas River was the fastest and most reliable means of travel through wild and rugged territory that would become Arkansas. The first settlements in the River Valley were born alongside the river. As succeeding generations ushered in new technology, and civilization emerged from the wilderness, the communities began to change. One of the more dramatic changes was the introduction of a new culture that came to the River Valley from across the Atlantic. It was an introduction made possible by the railroad. Highway 64, as it runs pin-straight through Atkins, passes alongside an iconic symbol of that culture. You can see it long before you reach downtown, but if you don’t notice from a distance keep driving until you reach the railroad crossing east of the depot with its rusty Lake Atkins sign. Just across the highway and east sits Church of the Assumption with a steeple stretching 121 feet to the top of the cross and towering above the downtown Atkins skyline. The rich heritage of the church can be traced back to construction of the railroad — an event that forever changed the River Valley. “The 1870s was the big migration into this area, and that is directly related to the railroad,” said Charles Ehemann. Charles is a historian and retired journalist born and bred in the River Valley. A member of Church of the Assumption for his entire life, the church is part of his heritage. Charles can trace that heritage back through many generations. “My parents, my grandparents, my great-grandparents and back to the Bartsons,” said Charles. Today, Union Pacific Railroad trains thunder through the River Valley on a path first traveled by the Little Rock – Fort Smith Railroad. By 1873, 100 miles of railroad track was on the ground, reaching from Little Rock to Clarksville. The railroad brought transportation of goods to and from the River Valley, and was an integral part of the big migration mentioned by Charles. At about the same time as this railroad construction, The United States experienced an influx of European immigrants. German, Swiss, Pole, French Bohemian, Belgian and Dutch immigrants found work and the promise of better days here in the new world. And while the immigrants came from a number of different countries, the majority of these people shared a common religion – Catholicism. With more immigrants arriving regularly, the small wooden building was outgrown by a burgeoning German Catholic population. Fr. Aton Jaworski, C. S. Sp., came to take over the flock in 1879… Then in rapid succession there came to these people a number of priests, until the year 1881. Inn this year the parish grew to about 60 families when several Catholic families moved in on a section of land on Crow Mountain and in the following year to about 90 families… The parish continued to grow during the next five years (COACCB 1979). 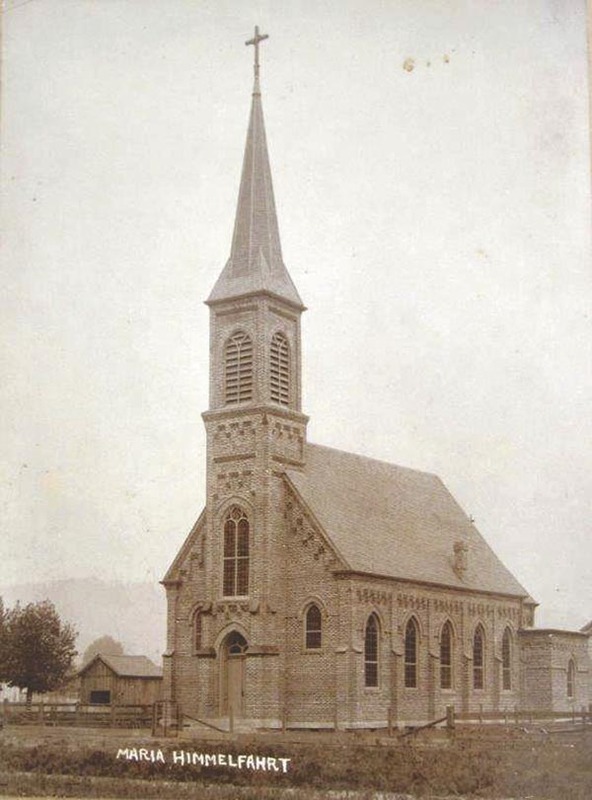 As a steady stream of new railroad workers poured into the valley, German Catholic settlements sprang up along the railroad tracks. For those of you wondering about the diminished influence of Catholicism for points north and south of the River Valley, ties to the railroad are why. River Valley railroad communities were mostly German Catholic, and new immigrants looking for work along with the comfort of their culture stayed close to those settlements. It was a pattern that quickly populated the eastern River Valley. The interior of the building is gorgeous. Diffused light filters through a spectrum of color in the stained glass windows, and gothic angles in tandem with symbols of the Catholic faith stand in contrast to a small town Americana vibe just outside the heavy wooden church doors. The acoustics are unbelievable. “These churches were built, of course before any sound systems were around,” said Charles. “You can actually go up to the tabernacle wall (located behind the pulpit) and you can whisper, and you can hear it back here,” said Charles, sitting on the back pew underneath the choir balcony. A slight echo somehow clarifies our conversation as I stand near the tabernacle wall just to verify Charles’ claim. He’s right about the acoustics. Those stained glass windows deserve another mention. Besides the interesting shapes and beautiful colors, the windows each feature names of church members from years ago. “When they started building the church they asked people to sponsor different things,” said Charles. “And even some of the families from back in Germany donated money.” Almost every name is German: Maus, Bartzen, Vegner (Wagner), Jungblud (Youngblood), Schmidt, Muller (Miller), Berkemeyer and others. Holding on to heritage is important for the church. Another example of this is the patterned wood floor dividing the sanctuary. Another unique aspect of the Church of the Assumption has had only three major priests over the course of 135 years. Attitude reflects leadership, and the longevity of the church is doubtless a reflection of long-term dedication from its leaders.